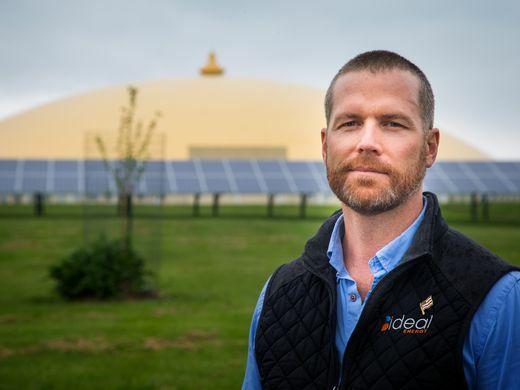 Iowa Public Television’s Iowa Entrepreneur aired a profile of a local sustainability company in Fairfield, Ideal Energy, co-founded by two MUM graduates, Troy Van Beek and his wife Amy Van Beek. The show first aired on IPTV July 28, 2017. Here’s the hyperlinked title and description to the video: Ideal Energy, Fairfield. The show opens with a description of what makes Fairfield unique and the influence of the local university, Maharishi University of Management. The university was the first in the country to offer a four-year degree in sustainability. Students and faculty practice Transcendental Meditation. The video profiles Troy’s time as a U.S. Navy SEAL in Afghanistan, a lead sniper, part of a team, to protect the head of the country. We later see him setting up his own security company in Africa. During this time he was having second thoughts about his chosen profession using guns to create peace. When he found Fairfield and MUM on the internet, he was inspired to make a life-changing decision and moved to this small Midwest city to become a student. It was there that he would meet his future wife, Amy Greenfield, an eco-developer. Troy was immediately recognized as someone exceptional and was asked to help with projects to upgrade the university’s buildings to greener standards. They supported his ideas and he learned by doing. He graduated in 2009 with a Bachelors of Science degree in Sustainability (now a BA in Sustainable Living) and the skills to make a difference. Mayor Ed Malloy invited Troy Van Beek and Lonnie Gamble, one of his teachers and a founding faculty member in MUM’s Sustainable Living department, to join a select committee to put a Go-Green Strategic Plan 2020 together for Fairfield. Reducing energy usage and making buildings more energy efficient was part of the plan. Companies supported this vision, but there was no one to help implement it. To fill that void, Amy and Troy started their own sustainability company, Ideal Energy. They became one of the first solar companies in Iowa, installing around two megawatts of solar power on various buildings across the state. Thanks to their efforts, Fairfield has the highest number of solar energy installations per capita in Iowa. They received national and international recognition. In 2014, Troy and Amy were featured in a Huffington Post article and video: What the EPA Clean Power Plan Means: More Jobs, Less Carbon. And they were invited to speak at the 2015 United Nations Framework Convention on Climate Change in Paris. I asked Troy how this IPTV show had come about and he said, “They reached out to us. We just made ourselves available. They did reference the Oprah video though. That may be where they heard of us.” Troy and Amy were included in Oprah’s televised visit to Fairfield, America’s Most Unusual Town, which featured an impressive profile of Troy. In the Iowa video, this dynamic young couple explain how they started the company with just the two of them doing everything. As the demand for more solar installations increased, they needed to hire staff. Troy feels his experiences as a Navy SEAL prepared him to build a team and inspire them with the vision they were manifesting. Not only were they saving energy costs for local businesses, they were also providing jobs, and improving the local economy. Troy also describes what he saw overseas—the disparities between the haves and the have-nots—especially when it came to energy and power. He sent me a quote for this article. It’s a powerful statement that sums up the core value of their company’s mission—to offer a proven solar solution that could put an end to wars over oil. Watch this inspiring 13-minute video profile of Troy and Amy Van Beek’s company, Ideal Energy, in Fairfield, Iowa. Visit their website: www.idealenergysolar.com. The 27-minute show of Iowa Entrepreneur, CapArms & Ideal Energy, aired July 28, 2017. Fast Forward: On Veteran’s Day, November 11, 2018, Ideal Energy Solar honored all who served. They also posted a video on their Facebook page of company founder & former US Navy SEAL Troy Van Beek talking about War and Sustainable Energy. It was a rebroadcast from his May 8, 2017 birthday video, on how clean energy is shaping our future. It’s a sane vision of equitable access to energy and what that technological change can do for the world’s economies and our planet’s resources. The university did build their off-the-grid Sustainable Living Center, the first of its kind. Troy installed a wind-turbine, with the help of students who built it, and added more solar panels on the energy cottage and new SLC classroom building. Last year the Des Moines Register’s Kevin Hardy wrote a profile on Fairfield’s entrepreneurial spirit and the University’s sustainability efforts, which included a video interview with Troy: Why this Iowa town is thriving when so many aren’t. And, while ABC News was in town covering the political campaigning, Josh Haskell dropped by for a live report from MUM’s SLC to interview students and learn about sustainability and Transcendental Meditation from Department head David Fisher. The Smithsonian Magazine rated Fairfield in their top ten list (No. 7) of The 20 Best Small Towns to Visit in 2013. Later that year, Des Moines Register columnist Rox Laird featured Fairfield’s civic collaboration and Maharishi University’s Sustainable Living Center in his Op-Ed piece: Fairfield defines community action. New updates from June 2018, US News and World Report selects Fairfield, Iowa with Maharishi University of Management as one of their Healthiest Communities, and September 2018, Ideal Energy’s solar-plus storage system for MUM is first large-scale installation of its kind in Iowa.